Last edited by Handsama on Sat Jul 23, 2016 4:29 pm, edited 3 times in total. Last edited by Handsama on Wed Jul 06, 2016 2:01 am, edited 1 time in total. manoypoe wrote: WHERE IS ANN LOPEZ? Ann Lopez is the delegate in white who posed with her legs somewhat spread in the top picture. She appears to be Hispanic. I'll go with SHRONN Tay. She's pretty (though common beauty) and the tallest among the rest. Ann Lopez... I hope they can churn better candidates for next year. MISS EARTH SINGAPORE 2016 CORONATION NIGHT - Saturday,23rd July 2015 @ Elizabeth Suite, The British Club Singapore! Join us in witnessing the 2016 Miss Earth Singapore ambassadors final crowning of the 4 Miss Earth Singapore winners (Earth, Air, Water & Fire). Miss Earth is a beauty pageant on the search for the most beautiful woman to serve as a role model to uphold the advocacy to preserve and restore Mother Earth. The winner of MISS EARTH Singapore will go on to represent Singapore in the international competition where she will compete on beauty and knowledge of environmental issues. 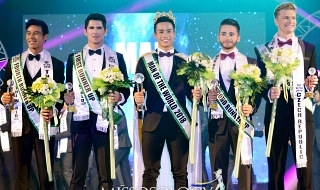 The winner of MISS EARTH will serve as the Ambassador to environmental protection campaigns worldwide. 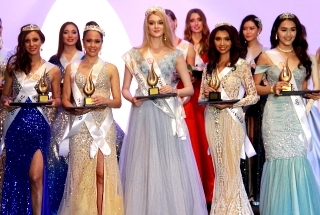 Eight finalists will be vying for the Miss Earth Singapore title on Saturday (23 July) at The British Club. The contestants, aged between 18 and 25, will be judged based on their ability to portray grace, elegance, outstanding personality and responsibility in championing an environmental cause. 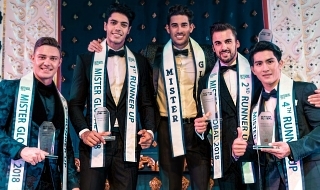 The pageant, which began in 2006, will also see the finalists compete for the “air”, “water” and “fire” titles. Other subsidiary titles include “Best in swimsuit”, “Miss Photogenic” and “Miss Friendship”. Miss Earth Singapore also will represent the country in the international round, known as Miss Earth International, which will see delegates from over 90 countries gather to support the event while promoting environmental causes. Supporting organisations, such as the United Nations and The Climate Change Project, will be witnessing the event as well. In addition, Miss Earth Singapore will spend a year becoming a “Green Ambassador” and participate in an environmental campaign called the Green and Glamour initiative, which was founded by pageant organiser C.T. Hansen International. Last year’s winner was 24-year-old events manager Tiara Hadi, who also volunteers at local animal shelter Animal Lovers League. “What I love about this pageant is the cause behind it, which is why I joined in the first place. I’ve experienced things I would’ve never been able to, such as speaking at the United Nations’ headquarters and meeting many beautiful people around the world,” she told Yahoo Singapore on Wednesday. What do you think of this year’s finalists? Last edited by davidrivera on Wed Jul 20, 2016 7:29 pm, edited 1 time in total. Last edited by davidrivera on Wed Jul 20, 2016 7:32 pm, edited 1 time in total. MISS EARTH SINGAPORE 2016 PHOTOSHOOT @ THE HAIR SECRETS. If it was going to be a pageant, it had to be Miss Earth. We live on an island, somewhere in the middle of the universe. A blue planet, surrounded by vastness. Teeming with life and creativity. until eventually, there is nothing left, but a dried curled core..
What do we do when there is nothing left? We belong to one home. Earth. Save it. Love it. Protect it. Manuela Bruntraeger is Miss Earth Singapore 2016! Congratulations! Good choice mama Cheryl.. Time now for India.. Height is 5'5" but a good choice anyway. Ea'rend¿l wrote: Height is 5'5" but a good choice anyway. The height doesn't matter as long as she is beautiful and devoted to Mother Earth. Last year the Guam girl got into top 16 being 5'3"
I THINK GUAM 2015 IS 5'4" OR 5'5".